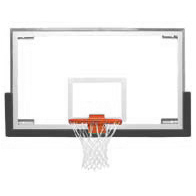 Includes our indoor/outdoor complete gym backboard system, competition grade break-away rim and polyurithane skinned high-impact backboard padding. The rim includes two heavy guage springs and can be calibrated for regulation play breaking away at 165lbs of pressure. 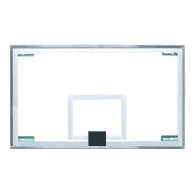 The backboard padding is molded around steel inserts that get bolted into the bottom of the backboard frame. Weighs 220 lbs. "Save big on in-door basketball equipment for your gym when you buy manufacturer direct"
Our in-door basketball equipment specialists are standing by to take your call and help answer any gymnasium questions you might have. Keith and Mr. Basketball, our senior support team, have over 28 years of experience with basketball equipment and will be more than happy to offer their expertise. We know that this is a big decision for your institution which is why we are here to make sure you get the right in-door gymnasium basketball system equipment. Get started with our great gymnasium basketball equipment today and save big with manufacture direct pricing. Call or chat live with Keith or Mr. Basketball about your gym basketball equipment needs today!